From Left to Right: Devi Suman, Jaydon Bailey, Rebbeca Heinig, Randy Gaugler, Geoffrey Kemble, Yi Wang, Kshitij Chandel. 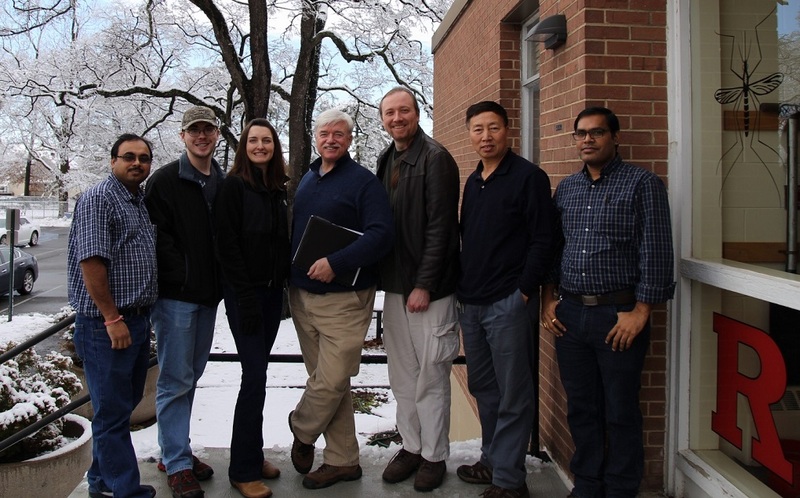 Collaborations continue with SpringStar as Jaydon Bailey, Rebecca Heinig, and Geoffrey Kemble visit to work with the Center’s team toward improving the design of the pyriproxyfen autodissemination system. Using 3D printers and precise measurements, the group is moving closer to resolving issues that will maximize pyriproxyfen application onto gravid female mosquitoes seeking to lay eggs. Attractive water sources within the devices are not available for egg-laying, and the egg-laden females leave and get painted with the juvenile hormone inhibitor which will be deposited where the eggs are eventually laid. While the eggs do hatch and develop eventually into pupa, that’s as far as their development goes. They never become adults. By exploiting female behavior, such devices are prime for controlling areas where hidden habitats occur and more traditional control techniques are less effective. This entry was posted in Uncategorized on February 8, 2016 by Lisa Reed.